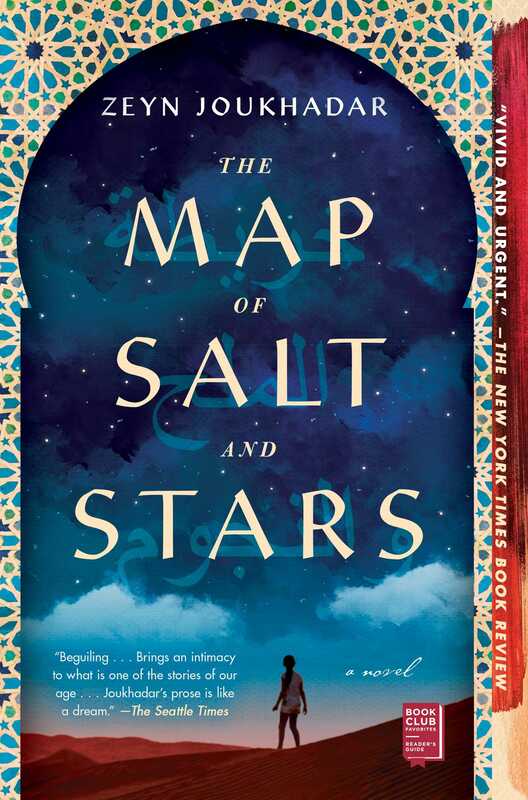 This reading group guide for The Map of Salt and Stars includes an introduction, discussion questions, ideas for enhancing your book club, and a Q&A with author Jennifer Zeynab Joukhadar. The suggested questions are intended to help your reading group find new and interesting angles and topics for your discussion. We hope that these ideas will enrich your conversation and increase your enjoyment of the book. The Map of Salt and Stars is the story of Nour, a Syrian American girl reeling from the recent loss of her beloved Baba (father) to cancer. After returning to Syria before the war breaks out, Nour and her family then must flee across the Middle East and North Africa in a desperate and dangerous search for safety. Her journey intertwines with the story of Rawiya and the legendary mapmaker al-Idrisi who made the same journey nine hundred years before in their quest to map the world. This rich, moving, compelling, and lyrical debut novel is the first to bring the headlines about the Syrian crisis to life, placing our current moment in the sweep of history. 1. What can you surmise from the novel about Baba’s connection to each of his daughters and how the girls come to depend on those bonds after the bombing in Syria? 2. How do the two different timelines influence the plot? Was this an effective way to tell the story? What demands does it place upon you, and what are its pleasures? Did it help you to feel closer to the characters? Why or why not? 3. What effect does Baba’s death have on Noor’s mother and her relationship with her daughters? 4. What affect does Abu Sayeed’s arrival have on Nour and her family? Compare and contrast Abu Sayeed’s relationship with Mama, Zahra, and Nour. Discuss the role of family and community in the lives of the characters. Provide examples of the different ways the author defines family in the novel. 5. How is The Map of Salt and Stars like others novels you have read about refugees, and how is it different? How much did you know about the Syrian refuge crisis before reading the novel? How does the novel challenge your perception of the Syrian refugee crisis? 6. How do the characters rely on their religion throughout the novel? 7. What meaning does the title of the novel hold for the characters? Why do you think the author chose this and what does it mean to you? 8. Child narrators in adult fiction are often used to question things that adults might take for granted. Did having Nour as the narrator for The Map of Salt and Stars change the way you viewed the events of the novel? Compare and contrast the benefits and disadvantages of having a young narrator. 9. Evaluate the importance of the constellations and how the stars help to advance the story in both timelines. Discuss the symbolism of birds. 10. What is the significance of the stone and why does Nour discard it? 11. Khaldun says, “the words of others can overwhelm and drown out your own. So, you see, you must keep careful track of the borders of your stories, where your voice ends and another’s begins” (page 133). Discuss the power of stories and the importance of the stories to the characters. Provide examples of the characters protecting their voices. How do you stay true to yourself? 12. Nour says to Yusuf, “I thought you were like the other bad men” (page 223). Discuss the significance of Yusuf. Where you expecting a different outcome for his character? Explain your answers. 13. How do the characters react to the trauma of sexual violence? What are its lasting effects? Analyze the reasons why Nour tells Yusuf and no one else about Huda’s attack, and why Huda chooses not to choose to disclose the attack immediately. What was your reaction to that scene? 14. Huda, Zahra, and Nour are very different? What makes them alike as sisters, and what sets them apart? How do they evolve over the course of the novel? 15. Compare and contrast the storylines of Rawiya and Nour. Discuss how Nour’s superpower and Rawiya’s being the roc slayer helped to save their families. 16. What is al-Idrisi’s role in the story? Does knowing that this character is based on a real person affect the way you read the novel? What are some of the pleasures and drawbacks of reading historical novels? Discuss what might have happened to the planisphere “guarded forever, safe from selfish hands” (page 307). 1. Are you a synesthete? Go to this website https://www.synesthesiatest.org/ to find out. 2. Create a map depicting places you traveled that had a major impact on your life when you were Nour’s age. What did you learn from that time? How did you change after that experience? 3. Name your top five favorite books with a child narrator. What are the advantages and disadvantages of having a young narrator? 4. The Map of Salt and Stars for the most part is a very realistic coming-of-age story of a Syrian refugee, but there are several instances when the story reveals magical elements. Provide examples from the novel of magical realism. How do these moments enhance the plot? 5. Visit the author’s website (http://www.jenniferjoukhadar.com/books/) to learn more and to read her collection of short stories and essays. I hope that this novel will serve as a starting point for readers to seek out accounts of the Syrian refugee crisis written by Syrians. It’s important to me that readers understand that this novel was written by an author with a mostly Western perspective, an author born in the United States and not in Syria, an author who has not lived through the war in Syria or been a refugee. While I have more nuanced insight into the situation as a Syrian American than someone without a link to Syria, my insight is still incomplete; and because it is impossible for a writer to ever entirely discard their lens of nationality, race, gender, and other factors, it is impossible for my American upbringing not to leave traces on this novel. That said, I wrote this book primarily for people like me: people living in the Syrian diaspora, unable to return to their ancestral homeland, who are in deep pain and grieving the beloved people, places, and heritage that have been lost and that continue to be lost every day. What can we take with us? What can be salvaged? Where can we call home? These are the questions I primarily concerned myself with in writing this book. I do hope, however, that non-Syrian readers will also, by reading the fictional story of a single family, have increased empathy for refugees and feel more personally connected to and invested in the situation in Syria after reading this novel, and that this emotional, empathic connection will help spur readers to combat the antirefugee, anti-Arab, and Islamophobic rhetoric that is deeply wounding the communities of which I am a part. Tell us more about the selection of the poems and the novel’s structure. What inspired you to choose the poems that open each part? Who wrote the poems? Who is the “beloved” of the poems? I wrote the poems. Each poem focuses on the themes and events of each of the book’s five parts. Although I prefer to leave my work up to the reader’s interpretation, I read the “beloved” of the poems in a couple of different ways. When I was writing the poems, I wrote them from the point of view of a character addressing Syria, but I think there are other valid interpretations, which I won’t reveal here to keep from spoiling the ending. Synesthesia alters perception, allowing people who have the condition to see the world differently. Which variation of synesthesia do you have and how does the condition influence your writing? I have several types of synesthesia, including grapheme-color synesthesia (letters and numbers evoke colors); sound-color synesthesia; smell-color synesthesia; taste-color synesthesia; and a few other, rarer types. It’s hard to say how it affects my writing because I will never know what it is like to not have it. For me, synesthesia makes everyday life an intensely colorful and sensory experience. Synesthesia links my senses together so that no experience is ever ordinary, and I suppose that shows in my writing. I’ve always been interested in the stars. The constellations and star names known in the West mostly come from Ptolemy’s Almagest (which in turn drew on even earlier sources), but the Arabs named these same stars and described their own constellations as well. Of these two traditions, I am far more interested in the star lore and knowledge of the natural world that my Arab ancestors possessed. I’m always interested in alternatives to Western traditional knowledge, and I think it’s important for non-European peoples to draw on their own rich traditions—for example, the breadth and depth of scientific knowledge created during the Islamic Golden Age, which is rarely acknowledged in the West. You worked as a biomedical research scientist before switching careers. What made you leave science to pursue a career in writing? What do you enjoy about both professions? I was a writer long before I was a scientist—I started writing short novels at the age of nine--and I wrote throughout my education and my career as a scientist. My dream had always been to be a novelist. But I think my interest in science and my interest in writing stem from the same place, which is a desire to know why the world is the way it is. Scientific inquiry offers one set of explanations, and writing, by examining the emotional reality of the human condition, offers another. One of your many interests is learning new languages. How many languages do you speak? Which is your favorite? What does the title The Map of Salt and Stars mean to you? Salt symbolizes several related themes in the book, including grief and healing from it, not only in terms of the sea’s salt but also the way that salt occurs as an imperfection in precious stones. For me, this symbolizes life’s traumas that, on the one hand, can be “polished” from us (healed) by the love of family, community, belonging—but also, on the other hand, the losses and pains of life that we have no choice but to endure. In its own way, grief and healing make us the precious stones that we are. We can’t always see this, just as we can’t always see the value of a raw gemstone when it comes out of the earth. This does not mean that suffering is inherently good or even necessary, but because we cannot avoid suffering and trauma, it’s important to remember that our traumas do not make us unlovable. They do not make us irreparably damaged. They do not make us worthless. There is life after trauma, and it can absolutely be filled with love and wonder. This lesson, dear reader, is for you. You signed with an agent through a #DVpit referral. What was that experience like? What advice would you give new writers? #DVPit was exhilarating, and I’m so grateful for the work that Beth Phelan does to organize #DVPit for maginalized writers. I think it’s a space that’s very necessary and opens doors for a lot of talented writers. Many of the other authors I’ve met as a result of #DVPit have become friends whose work I deeply respect. The experience of pitching was surreal. I had never participated in a pitching event before, and the day went fast. 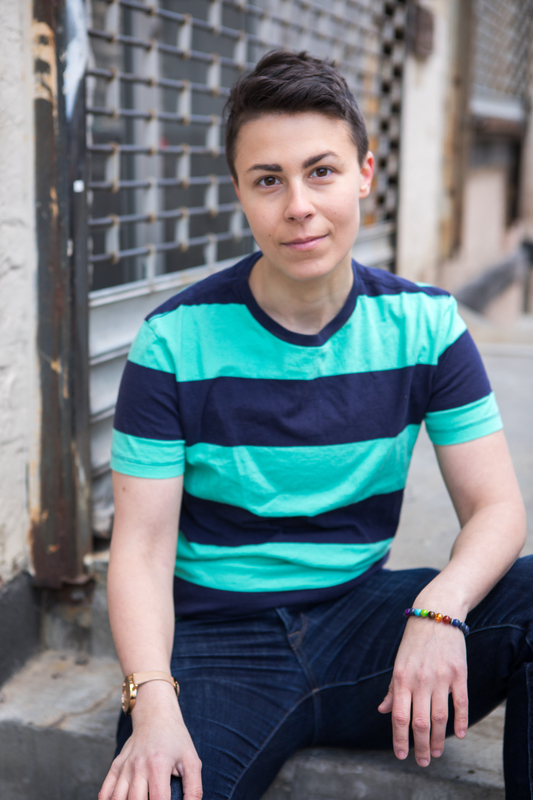 I signed with my agent, Michelle Brower, through a referral from #DVPit-participating agent Amy Rosenbaum, and I knew immediately that Michelle and I were on the same page about our visions for what we wanted the book to be. Michelle is very insightful and absolutely helped to push The Map of Salt and Stars to be the best version of itself that it could be. I’m so grateful to have her in my corner. As for advice for new writers: read a lot. Read everything. Don’t put too much pressure on your first novel; give yourself permission to play, and write it for you. Write the book you want to read that only you can write. I’m a firm believer in writing for yourself first, and this is especially true while you’re honing your craft. You don’t have to blow anyone’s mind with your first effort. You just have to finish it. Part of what makes you a writer is the fact that there will always be another project. Eventually, try to find other writers whose work you respect to read and critique your work. But whatever you do, make sure you don’t write just what you think others want to read. It took me a long time to start writing about people like me: Arab Americans, people with interfaith families, people living in diaspora, people struggling with trauma or feeling like they didn’t belong. But it was only once I started writing from those difficult places that my work began to come alive. Don’t let anyone tell you that people like you are not worthy of being the heroes of your stories. Why did you decide to make Nour the narrator of The Map of Salt and Stars? What are her strengths as narrator? I think young or child narrators allow us to see the absurdity, terror, or joy in certain situations much more clearly because they don’t try to rationalize the world the way that adults do. They observe things and can hold contradictions without trying to explain them away. That was a quality I wanted in the narrator of The Map of Salt and Stars; I wanted a narrator who would not flinch or look away from the pain inherent in the story, so that readers would not be able to look away either, but I also wanted a narrator who would find beauty and joy in unexpected places. I think Nour does that very well. You are also an award-winning author of short stories. What is the difference between writing a short story and writing a novel? The most challenging and rewarding thing for me about writing short stories is that because of their length, every single word has to be in just the right place and has to do a minimum of double duty—better yet, it has to advance the plot, build character, create tone, and convey theme at the same time. To waste a single sentence in a short story can unravel it. I think of both short stories and novels as engines; they just have to be different sizes, because they power completely different story vehicles. A short story engine is delicate where a novel engine must be robust. I do love that because short stories don’t have to sustain themselves over many pages, you can create a much more delicate story milieu that would be impossible to sustain over three to four hundred pages. The intersection between short stories and novels, for me, is in the fact that a short story has the same pieces as a novel, just writ smaller: you can have a complete three-act structure in a short story, and you certainly need to have a character arc, but you can gesture at parts of these structures that would need to be more fully developed in a novel. For this reason, I like to write each of my novels as a short story first, a kind of thumbnail sketch or bird’s-eye view where I can see the novel’s structure as a whole and make sure it’s working before I expand it. I talked about this at more length in an essay I wrote for Bird’s Thumb in 2017. My earliest influences were mostly fantasy novels like Tolkien’s The Hobbit and Tamora Pierce’s Song of the Lioness quartet. As I got older my writing was also influenced by the magical realism of Gabriel García Márquez (One Hundred Years of Solitude is tied for my favorite book of all time) and Jorge Luis Borges. Some of my favorite contemporary authors include Helen Oyeyemi, Roxane Gay, Rabih Alameddine (The Hakawati and The Angel of History are tied for my other two favorite books), Randa Jarrar, and Celeste Ng. Without saying too much, I’m working on a second standalone novel that discusses Syrian immigration to the United States over the last century, Islamophobia and anti-Arab sentiment in post-9/11 America, and the particular mythology of New York City. Served up, of course, with a healthy dose of magical realism.